Want to learn how to grow mushrooms? I’ve been hearing more and more about homesteaders and farmers growing mushrooms and was curious to find out what all the fuss is about. 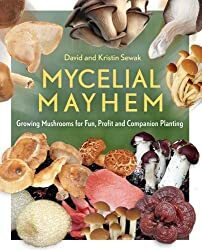 Though I love to eat mushrooms, I hadn’t seriously considered growing my own until I read Mycelial Mayhem by David and Kristin Sewak. Now, I feel like I have really been missing out by purchasing mushrooms from the supermarket as there are so many interesting and delicious types of mushrooms beyond the white button and portobellos typically found in grocery stores. Besides, with unregulated, gene edited mushrooms coming on the market, I’d rather grow my own! From a young age, David picked wild mushrooms with his grandfather and now he has been cultivating them for more than 15 years. After composting mushrooms and incorporating used mushroom mulch in his garden, David realized that mushrooms can help to improve soil as well as enhance the flavor and nutrition of vegetables. For example, David and Kristin credit wine cap stropharia in their garden for improving the taste of their kale and subsequently better sales. Kristin’s interest in mushrooms extends to their medicinal properties – she makes supplements, reishi tea, and even a mushroom facial cream. For more information and to connect with David and Kristin, visit the book website and blog at www.mycelialmayhem.com. Section I: Mycelia includes mushroom purposes, their physical structure/components, and how mushrooms benefit humans as well as the environment. Did you know that mushrooms are used to shrink tumors, help with dementia, lower blood pressure, clean up pollutants in the environment, and create compostable packaging material? Section II: The Stem includes instructions for cultivating different types of mushrooms (from purchasing spawn to knowing the right time to harvest), collecting and purveying wild mushrooms, and using mushrooms for companion planting and sustainability. Indoor and outdoor growing techniques, the degree of difficulty for growing different types, materials/supplies needed, growing mediums (such as wood/wood chips, straw, rope, and cotton seed hulls), and instructions for pasteurizing straw are discussed. Section III: The Fruit of Your Labor covers culinary and nutritional benefits of mushrooms, guidelines for harvesting, storing, and processing mushrooms, and recipes. Nearly 70 pages are devoted to launching, managing, and marketing a mushroom business. In the appendices, there are lots of sample marketing and communication materials. Section IV: Spreading the Spores – If you’re not already convinced, David and Kristin’s concluding statements will likely inspire you to grow mushrooms! In a helpful “Assessment Checklist” David and Kristin outline key considerations and supplies you’ll need to start growing mushrooms. 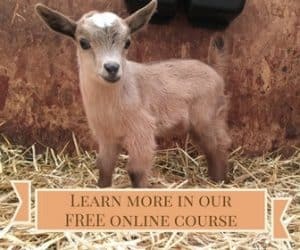 How much land you have, the species of trees on your land, and your access to water, shade, and substrate/growing mediums will impact which growing techniques and types of mushrooms will be most successful. Be prepared, you’ll either need to know how to use a chainsaw or find a lumberjack who can help you cut logs! I plan to start with growing wine cap stropharia using David and Kristin’s “wine cap lasagna” method, which doesn’t require cutting logs and can be placed in your garden under the shade of kale plants. Essentially, this involves layering 1-2 inches of hardwood (they use oak, maple, and beech) mulch, then a layer of straw (should be natural, uncolored, and untreated) with wine cap spawn sprinkled on top, another layer of hardwood chips, more straw and spawn, and a third/final layer of hardwood chips. Then, water thoroughly and keep it moist. David and Kristin use drip hoses in the evening for about an hour. A 5.5 lb. bag of wine cap spawn can inoculate a 20 inch row. If you start these this spring, you should have mushrooms by fall! Thx looks like a great book! What a great giveaway! We’ve wanted to grow our own mushrooms for many years now, but never found the right info on the how to’s. This would help alot! We’d grow the kinds that would help medicinally, like the ones to shrink tumors…Ashawanga (sp?) … and whatever the book suggests as hub’s is trying to get rid of a tumor. And, the edible delicious ones!!! I look forward to reading Mycelial Mayhem– great title! I want to grow wine caps! I’d love to win this book! I’ve tried growing mushrooms before and didn’t have much success. I’d grow anything easy for beginners. 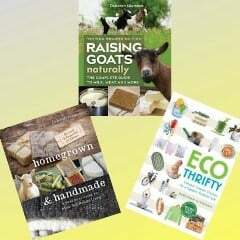 Books looks chock full of great growing info.! I would love to add it to my library. FYI– rafflecopter is wonky…not letting me enter again today. I’ve always been interested in growing mushrooms. Would love a copy of the book – thanks! Rafflecopter only allows entry once? Thanks for asking! You can enter multiple ways. You get one entry for a blog post, one entry for visiting Thrifty Homesteader on Facebook, and one entry for tweeting about the giveaway. You can get an additional point once a day for tweeting about the giveaway again. To get your entry, always be sure to click the button on Rafflecopter whenever you do any of these things. For example, be sure that you clicked on “leave a blog post comment” (since you already left a comment). If you did that already, then the option will be grayed out, and you won’t be able to click again. But the Twitter button will reset every day, so you can do that one multiple times. Ahhhh! That is why Twitter worked & the multiple blog comments didn’t register! LOVE the blog! Keep up the great work!